This week Battlefield V released the Tides of War, the first chapter in what will be a seasonal event similar to season passes in other titles but without the extra fee. 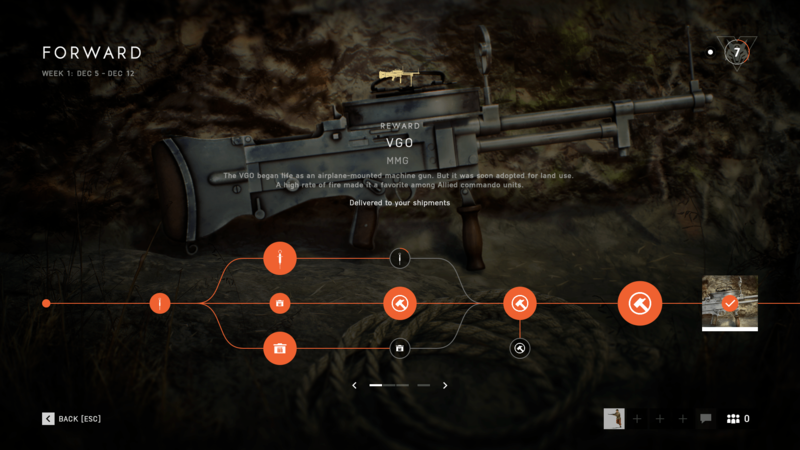 Week 1 runs from December 5 to December 12 and rewards a medium machine gun for completion, the VGO. Since this is a Battlefield game, you may have noticed that this feature has launched in a rather buggy state. Many players are noting that various challenges are simply not functioning, specifically the final task of getting one kill with a stationary vehicle. MMO Fallout has discovered a possible workaround that should fix this for many (your mileage may vary) of you. It looks like most of the progress-stopping bugs can be fixed by specifically playing on the map Arras. I was able to test other maps and couldn’t get any kills to register the task, but one kill with the stationary machine gun on Arras and the task was complete. Again, your mileage may vary. In many cases it appears that the other tasks down the line are simply not registering until they miraculously start for no rhyme or reason.